A Very Special Presentation! Highly Recommended! Join Understanding Our Differences and The Newton Partnership for a book talk and signing with acclaimed, National Book Award-winning author Andrew Solomon on Monday, June 17 at 7:00pm, in the Newton North High School Auditorium. 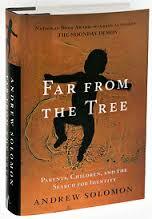 Solomon will be discussing his monumental New York Times bestseller, Far from the Tree, about the extraordinary families of individuals affected by cognitive, physical or psychological differences. Its focus is on parents who learn to cope with their exceptional children, and find profound meaning in doing so. This thought-provoking book affirms the values of empathy and acceptance and is relevant for all parents and families. Books will be available for purchase and a book signing will follow the event. Suggested donation: $5 at the door.